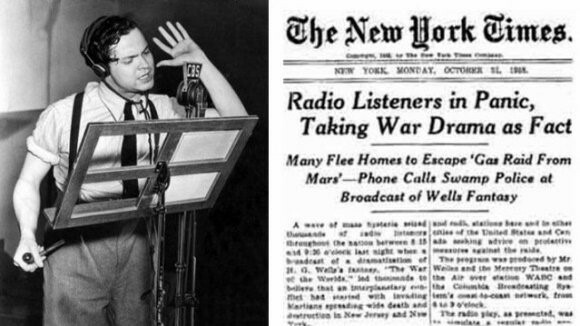 Originally broadcast on CBS Radio on October 31, 1938, by The Mercury Theatre on the Air, this infamous radio play, based on the novel by H. G. Wells, had many terrified listeners convinced that an actual alien invasion of Earth was taking place. Fast forward to 2019 and join our cast of voice actors and live sound effects artists as we recreate this infamous radio broadcast LIVE onstage. Featuring (in alphabetical order): Michael Budnick, Erin Wilbur Gilgur, Mark Herrmann, Joelle Noll, Jonathan Noll, Jonathan Peck, Dann Pryce, David Toussas & Larry Wilbur.